The F-35B’s developers may have adopted many features of the Soviet aircraft, but Lockheed Martin’s fighter remains a unique model. When it comes to vertical takeoff and landing (VTOL) military aircraft, which were first developed in the 1960s, few fighters have as much in common as the Soviet Yak-141 and the American F-35B. The F-35B was unveiled almost 12 years after the Yak-141. Is the American VTOL fighter, which was developed in the 1990s, a copy of the Soviet military jet? RBTH tries to find out. With an ability to take off from small platforms and hang in the air, the VTOL promised to be a new milestone in the development of military aviation. The brightest and most successful developments (not without shortcomings) were the British Aerospace Sea Harrier, the Yak-141 and the F-35B. The Yak-141 was first developed in the Soviet Union in the 1970s. Not having large aircraft carriers like the United States, the USSR looked to create a jet that could take off from small platforms, such as helipads and Project 1123 anti-submarine cruisers like the Moskva, Leningrad and Kiev. The Yak-141 surpassed its predecessors (Yak-36 and Yak-38), as well as its foreign counterparts (Harrier, Dassault Mirage IIIV) and took part in the struggle to become the best naval VTOL aircraft. But destiny did not favor the Soviet machine. A high rate of accidents, the collapse of the Soviet Union and the subsequent abandon of funding closed the project. The fighter had four prototypes, but never went into serial production. In 1995, the U.S. weapons manufacturer Lockheed Martin offered to jointly cooperate with the Yakovlev design Bureau (developer of the Yak-141). The arrangement ended after one year, but was a landmark as it was the first instance of military-technical cooperation between the former irreconcilable enemies. Lockheed Martin acquired all the technical documentation of the Yak-141 from the Yakovlev Bureau. Shortly after that, a prototype of a carrier-based VTOL fighter, which would be known later as F-35B was unveiled in the United States. It looked surprisingly similar to the Soviet Yak-141. The design and layout of the Yak-141 and F-35B are almost identical. The location of the compartment with the lifting fan and the location of the tail beams respective to the lift-piston engine are the same in both planes. But the vertical takeoff of the F-35 is significantly different from that of the Russian aircraft. The Yak-141 performed a vertical takeoff because it had three turbojet engines: A R79V-300 engine with a movable nozzle and two lift RD-41 engines that were installed in the compartment behind the cockpit. 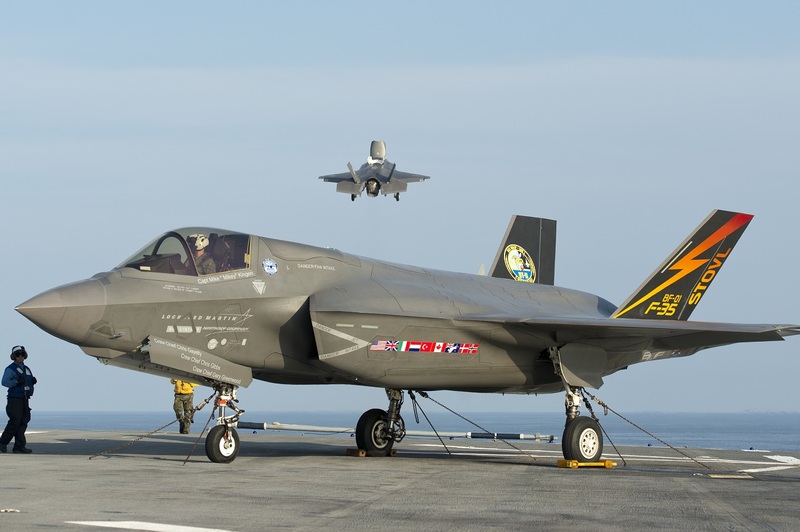 The designers of the F-35B implemented a relatively simple and effective scheme using a “cold” lift fan, whose transmission is driven from the lift-piston engine with a rotary nozzle. Military-technical cooperation between Lockheed Martin and Yakovlev in the 1990s undoubtedly played a role in the creation of the F-35B. The Americans took a lot from their Soviet counterparts. However, to call the F-35B copy of the Yak-141 is an exaggeration. The F-35B is a unique model. Is there a future for VTOL planes? More advanced technology is required to make VTOL aircraft a mainstay of the Russian Aerospace Forces. VTOL jets have indisputable advantages such as the possibility of takeoff and landing on a small area that does not exceed the dimensions of the plane, and the ability to hang in the air and then turn and fly sideways. However, negative factors exceed the positive features. Highly qualified pilots are required to man this type of aircraft. Military expert Dmitry Litovkin told RBTH that the main drawback in the use of VTOL aircraft was the fact that vertical takeoff and landing are almost unmanageable at the moment. In the past, sharp gusts of wind blew the aircraft over the side of the carrier, leading to a large number of incidents and accidents in the Soviet Navy, the expert said. VTOL jets have less capacity and flight range than other fighters. There is also a cost factor with vertical takeoffs consuming a high amount of fuel. In addition, the design of this type of aircraft is very complicated and expensive. Will Russia and the U.S. enter into another arms race? The F-35B is currently used by the U.S. Marine Corps. The price of a F-35B, as per a 2017 agreement between Lockheed Martin and the U.S. Department of Defense, is $122 million, which is more expensive than other modifications of the aircraft: the F-35A costs $94.6 million and the F-35C- $121 million. Moreover, the F-35Bs used by the U.S. Marines don’t use their unique abilities. They take off and land on the standard decks of large aircraft carriers. In the U.S., there is a tendency to replace VTOL jets with convertiplanes, such as the Bell V-22 Osprey. There are no immediate plans to develop military VTOL aircraft in Russia, Litovkin said. Su-33 and MiG-29K aircraft can takeoff in a short distance, allowing them to operate from small airfields or short decks of aircrafts carriers. The U.S. has no aircraft with such capabilities, Litovkin said. At the same time, the Russian Mi-26 helicopter can perform all the tasks of the Bell V-22 Osprey convertiplane, he added. Why is there something Russian about China's new aircraft carrier?